As you know, tomorrow is 25th July, Saint James Day (Santiago Day) and also Galicia’s Day. 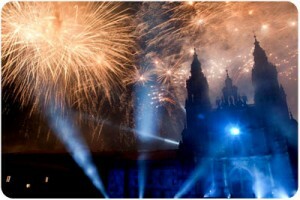 Santiago de Compostela, at the end of the Camino de Santiago, is in celebratory mode and so are we at CaminoWays.com! The ‘Apostle Fireworks’ (Fogos do Apóstolo) take place in Santiago de Compostela at midnight today to kick start Santiago’s biggest day of the year. Many pilgrims will try to reach Santiago for this special date.